Not all good results come from planning. Sometimes, they are just gifts. But in either case, we should be grateful. Looking around among my seedlings, I find instances of both, sometimes in combination. 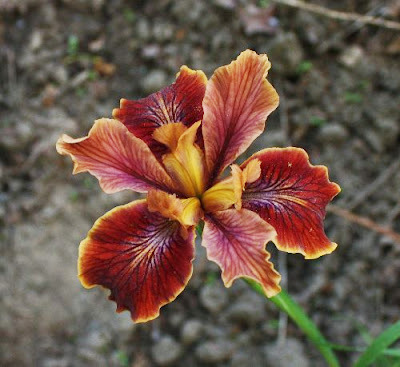 When I first saw 'Lumalite' (J. T. Aitken, R. 1995) at an iris show, I was so taken by its glowing appearance that, with the exhibitor's permission, I took it outside into the daylight to see if the effect lasted. I acquired it as soon as I could, and crossed it with, among others, 'What, Again?'. I confess that I had no plan at this point -- just curiosity to see what the glowing effect of one combined with the curious color composition of the other would produce. What I got was a gift: 'Elfin Sentinel'. I was delighted with the flower and registered it, but it had a shortcoming (literally) that caused me not to introduce it: The bloom barely topped its foliage. Looking at its brilliant colors and clear patterning, however, I wondered what a back-cross to its parent 'Lumalite' would bring. For one thing, I wondered if the slight blotchiness of 'Lumalite''s falls could be erased. And it worked! The new seedling retained 'Lumalite''s glowing heart, cleaned up the falls almost entirely, and added ruffles. I introduced it as 'Bright Sprite'. 'Tis said that ignorance is bliss. I can attest to that. At a meeting of one of our iris societies several years ago, two good long-time hybridizers of my acquaintance were discussing the rebloomer 'Best Bet' (Schreiner's 1988) and the difficulty of keeping it alive (at least, in our area). Both agreed that they would never use it in hybridizing, because of that fault. I said nothing, since I already had a cross from 'Best Bet' that hadn't yet bloomed. When it did bloom, it was a perky, hardy little border bearded amoena that, because of its colors and its parent's unhappy reputation, I registered as 'Against the Tide'. 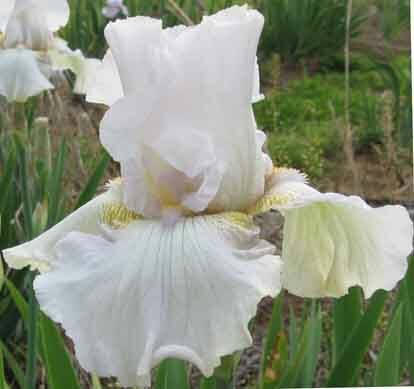 And if one looks in the Iris Register at the 64 other entries involving 'Best Bet', it's obvious that many other hybridizers, as well, were either unaware of or undaunted by 'Best Bet''s bad press. Another example of when the planning worked was the crossing of Barry Blyth's 'Knighted' (1987/88) with seedling 962N: (952Y3: (Champagne Elegance x 93L1: (Wabash x yellow Wabash sdlg.)) x Best Bet). Of course, a plan doesn't always work. I had great hopes for the cross of 'Aura Light' (Blyth, R. 1993) by 'Romantic Evening' (Ghio, R. 1994). The broad, flared, well-ruffled falls of both, with their heavy substance and bold colors, and the heritages suggesting the possibility of an amoena . . .
--- BUT . . . 'Aura Light', for all its spectacular bloom beauty, is just a tad short in stature, and it passed it on to its kids, so that, in my estimation, these two seedlings don't have quite the proportion of height to bloom size that they should have for introduction. But, with planning and and a bit more luck, do I hope that they'll still figure in something beautiful? You betcha! A while back, I promised to tell you about some of the most popular new introductions for 2013. I know it is late in the season, but I'll continue the series anyway so that you can add to your lists for next year. So here is another 2013 favorite of irisarians, this time from Rick Tasco of Superstition Iris Gardens in Cathey's Valley, California. Rick says "our 2013 introduction that has been drawing the most interest and the most sales has been "Molten Flame." It is 34" tall and is heavily ruffled with an intense red orange beard. It has up to 10 buds, with triple sockets at times. It is a cross between one of my Dykes Medal winners ("Golden Panther") and a brilliant intense orange seedling by Ben Hager. Ben gave us that orange seedling before his death and we've been working with it for years trying to capture that shocking intense brilliant orange color, which has to be seen to be believed. Recently we've been getting close to that color in a proper flower and "Molten Flame" is a result of that breeding. It has taken many years and different crosses to get all the proportions right because Ben's seedling is too short to be a Tall Bearded and the flower is too big for it to be a Border Bearded, that it why it was never introduced either by Melrose or by Cooley's after Ben's passing. "Molten Flame" finally is tall enough at 34" with a heavily ruffled moderately-sized flower. "Golden Panther" helped by passing on its superior bud count." "Those of you who have visited our garden have undoubtedly seen the Hager seedling. At times, we try to "hide" it in the seedling patch because everyone always asks about that "orange flower". It can be easily spotted in a crowded seedling bed. We will continue to work with it and see what else develops." Bright orange tall bearded irises are few and far between, so we are quite excited about this break in color. I love orange and use it extensively in the garden, so I look forward to seeing this iris in person. Do you grow orange irises? Which ones? Are Your Irises Going to Pot?! As boxes of rhizomes arrive at homes around the country, and gardeners talk about their new treasures, the discussion sometimes turns to the practice of potting. Some gardeners view potting rhizomes as an unnecessary extra step. Other gardeners view it as an integral part of their iris gardening. Though the practice was once considered unusual, it appears that many gardeners have added potting to their gardening routine as they learn more about the potential benefits offered. But, just how many? 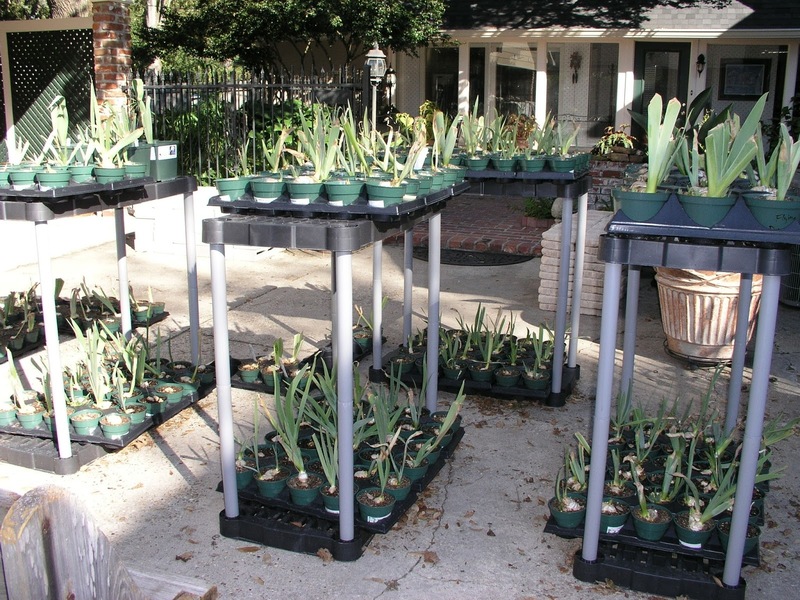 A recent survey of iris enthusiasts showed that 12% of respondents potted all of their newly dug rhizomes each year. Another 10% responded that they potted any rhizomes that required special care. The remaining 78% indicated that they planted all of their rhizomes directly in the garden. With 22% of respondents potting to some extent each year, let’s take a closer look at the “why” and “how” of this practice. Of that 22%, the majority indicated that they employed potting to help protect newly dug rhizomes from extreme environmental conditions while establishing new roots. In the South and Southwest, gardeners wanted to minimize exposure to excess heat and humidity. In many cases, these gardeners also wanted to delay the chores of reworking the soil and planting until the cooler weather of fall. In the North, gardeners potted rhizomes that arrived late in the season, when planting directly in the garden increased the risk of freeze damage. Gardeners who indicated they employed potting with rhizomes that were small, with rhizomes that appeared to be struggling in some way, and with rhizomes that warranted special care came from all geographic regions. 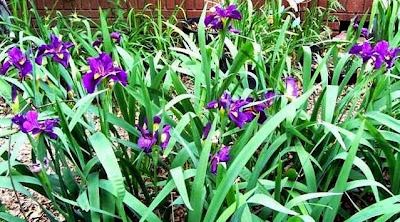 Perhaps the most widely read information about potting rhizomes was written almost twenty years ago by Walter Moores, who grows and hybridizes irises in Yalobusha County, Mississippi. Mr. Moores has introduced almost 90 cultivars since 1977, and 18 of those have received AIS awards. 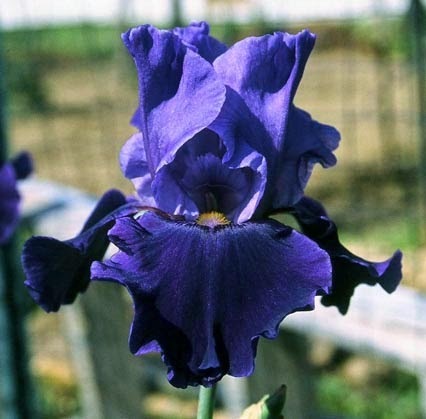 His earlier work focused on reblooming irises, some of which can still be found in commercial catalogs today -- almost 40 years later! His recent work focuses more on tall bearded irises and species crosses. 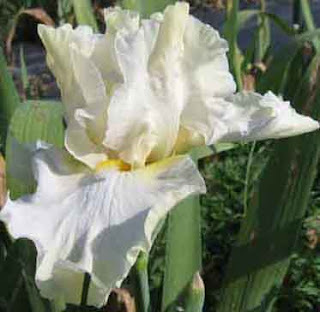 Having written about the subject of potting in an issue of the AIS Bulletin, Mr. Moores followed up with an article in the Tall Bearded Iris Society's Tall Talk (September 1998). 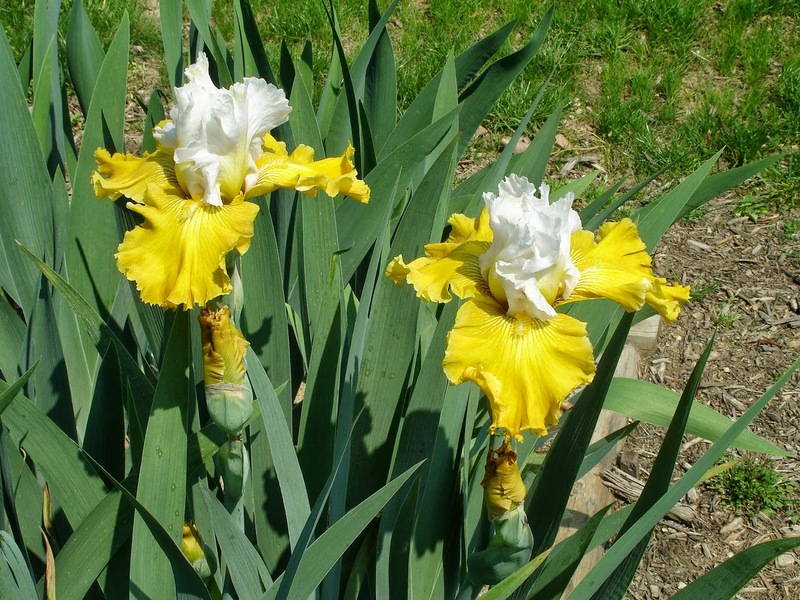 Demonstrating that this information can prove useful in diverse climates, the article has been reprinted by many local clubs throughout the United States and now also appears on the current webpage of the Canadian Iris Society. Rather than trying to rewrite a classic, Mr. Moores’ original article is presented here, with just a few additional notes at the end. 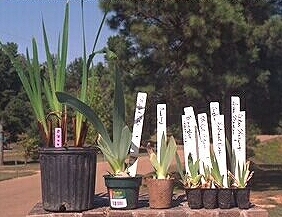 Over the years the reasons for potting irises to give them a head start in growth have remained constant, but the techniques have changed somewhat. 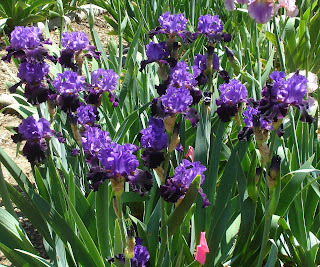 What follows is my experience with potting irises for over twenty years. I agree with Bob Strohman [of Louisville, KY] that when the new irises arrive, "It´s over 90 degrees, the ground is too dry and hard to dig, and we´re leaving for a vacation trip tomorrow anyway." So, if you live in the hot, humid South or Southwest and you bought a $45 introduction, you need to think seriously about setting that plant or any other for that matter out in the broiling heat. The alternative is to pot incoming rhizomes and to place the pots in a shady location. Potting irises has unexpected rewards. While it is so hot at planting time, winter weather and rhizome heaving seem remote. But that extra step of potting back in July and August to protect rhizomes from heat will eliminate rhizome heaving when the ground goes through the freeze/thaw cycles of winter. The root systems developed while the irises were potted will enable the plants to remain where they were planted. Potting does reduce losses during these two susceptible seasons. If bloom is expected on first year plants, potting them and getting them established early makes bloom a sure thing. There are more reasons for potting irises than not, and growth and bloom seem to be the priorities for doing so. The most desirable month for planting or transplanting irises in hot climates is September, when cooler temperatures make it more bearable to be outside, but it is often difficult to find a commercial source that still has blooming-size rhizomes for sale. Also, it has been my experience that when I have ordered early and requested late delivery, I have received inferior rhizomes. I have also had cancellations or gotten substitutes when I ordered in early spring and requested late August or September delivery. Typically, September is the driest month in the South, and the thirst of newly planted rhizomes can cause an added expense by inflating the water bill. So, to ensure you get quality plants of desired varieties, order early and pot the rhizomes. The boost the rhizomes get while in pots will almost guarantee first year bloom in your garden. When a box of iris rhizomes arrives, open it immediately and check the rhizomes for mold or rot. If you find any, trim it off. Also, cut or shave off all roots. Then prepare a mixture of one part liquid bleach to nine or ten parts water. Soak the rhizomes for at least thirty minutes. Allow the plants to air dry before planting. The clorox bath is necessary to kill any rot potential that might have developed in transit and to prevent it from forming while the irises are potted. Plants may stay out of the ground indefinitely, but if a good head start is desired, the rhizomes should be planted within a day or two of receiving them. For years at iris sales or auctions I had always seen a few irises potted in black plastic pots. I used gallon pots when I first started potting irises, for I thought I needed at least a gallon of soil for the plant to survive. I did not trim the roots, nor did I provide a bleach bath. Most of the time I just used garden soil that became as hard as a brick when the pots dried out. At planting time it became a chore to move the heavy pots to their blooming spot and to dig a hole large enough to accommodate the contents of a gallon pot. After experimenting with a few four inch plastic pots, I have decided that they are perfect for the potting procedure. I have not found a rhizome too large to fit in one. If a rhizome has a snout (an extension of growth on the toe), cut it off and consider it to be a second rhizome and plant it in the same pot with the mother rhizome. The potting mixture should neither be friable or compact. A happy medium consists of one-third Magic Earth (a potting soil with fertilizer), one-third garden soil, and one-third sand mixed well. No other fertilizer is necessary. Place soil mixture in four inch pots up to the rim and soak with water. The soil may settle and more may be needed. Set the rootless rhizome half exposed in the soil and firm it with your fingers. Make sure the soil level is at the top of the pot so no water can stand in the pot. It would be almost impossible to place a rhizome in such a small pot if it still had the roots intact. New roots will form quickly and wrap around and around the soil in the pot. Tag or label the plant as usual. Watering the plants may become necessary depending on the weather. It is best to water the pots from the bottom up. Add water to a level of three inches in a galvanized tub, and place the pots in the tub. Allow the water to be absorbed through the drainage holes. Remove the pots when the soil is damp. It is important to move the pots occasionally so roots don´t find anchor through the drainage holes. A few weed seeds may sprout, but these are easily removed. Plants may be left in the pots until October to be planted where they are to bloom. In the meantime, preparations should be made for the iris beds or rows that will accommodate the new plants when it is time to unpot, one tap with a trowel will loosen the soil and root ball. That same trowel should have been used to dig a hole about four inches deep. For an extra boost, a balanced fertilizer might be added to the planting hole. Firm the soil around the plant and water. 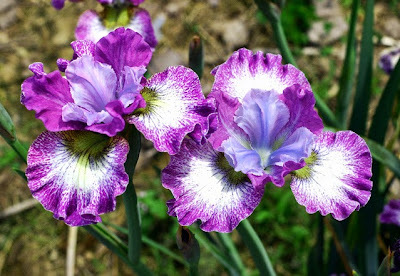 In summary, many people would consider potting irises to be double trouble. It really isn´t when one considers the growth and bloom potential of the potted irises over the traditionally planted irises. Losses are almost nonexistent. to be reprinted for educational purposes. Mr. Moores recently stated that the one change he would make to the above article is to add this advice: "When potting rhizomes, remove the leaves as they die to prevent moisture accumulation." Additional Notes: Magic Earth is recommended in the article above, but it is no longer available. Magic Earth had a guaranteed analysis of 9-6-5. As a substitute, look for an organic potting soil with a similar analysis, such as Miracle Gro Organic Potting Soil. 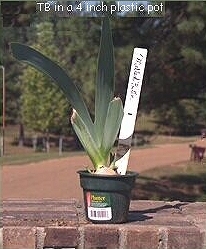 Do not use Miracle Gro's standard potting soil, as it typically has too much nitrogen for use with bearded irises. Once you have selected an appropriate potting soil, it can be amended to best suit your climate. 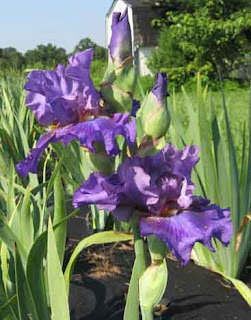 Common amendments used when potting bearded irises include Canadian sphagnum moss, coarse sand, horticultural vermiculite, bone meal, dolomitic lime, Super Phosphate, and granular fungicide. If adding fertilizer, choose one that is slow-releasing and low in nitrogen. Select free-draining pots from 4" to 6" in diameter. Do you have a technique or cultural practice that has proven beneficial in your iris gardening? Share it here! It is with much pleasure that I present to you the winner of the 2013 Eric Nies Medal: 'Missouri Orchid' by Dave Niswonger. Congratulations to Mr. Niswonger on winning yet another award for his outstanding work. 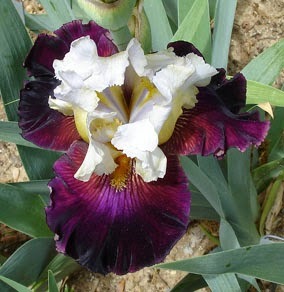 I can't wait to see this Spuria iris in person. 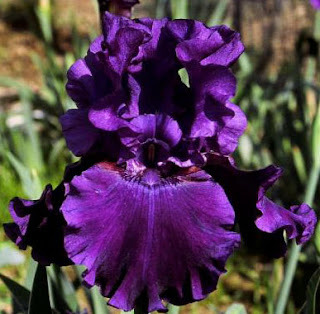 With its many tones of pink, red, burgundy and fuschia, I think it will become a very popular iris for many. Keep in mind that Spuria colors many times changes according to soil condition and climate, so there will variations in the garden we would surely appreciate. Other characteristics, such as form, signal size, with of standard and falls, all of these should remain the same. Spuria irises are tall (2 to 5 feet in height) and elegant, and have very attractive foliage. The shape of the bloom often suggests orchids and the colors range from white and yellow through blue, wine and brown, often with bright yellow signals. This horticultural class is equivalent to the botanical Series Spuriae. The highest award is the Eric Nies Medal. 'Missouri Orchid' (O. David Niswonger, R. 2006) Sdlg. Sp 9-99. SPU, 38" (97 cm), Medium Lavender self, Falls with a hint of pink, yellow signal spreading to buff. 'Missouri Dreamland' X unknown, probably 'Rivulets Of Pink'. 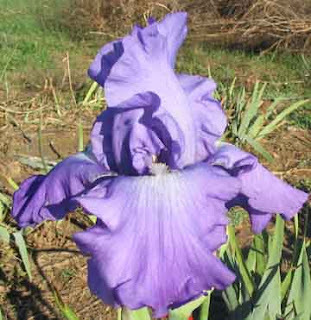 Cape Iris 2006. Honorable Mention 2009; Award of Merit 2011; Eric Nies Medal 2013. 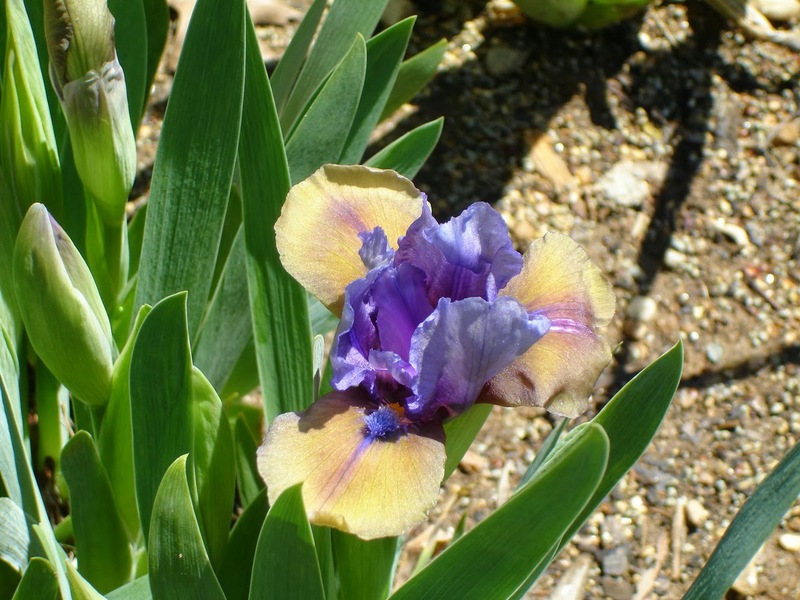 For more information on Spuria irises, please visit the Spuria Iris Society. An Eye to the Future-2. People love to talk about their favorite finds in the seedling patch. Dr. Lloyd Zurbrigg talked about ‘Renown’ because it was a seedling that rebloomed well for him. Then he introduced it in 1992. There were many reports of it reblooming throughout the country. 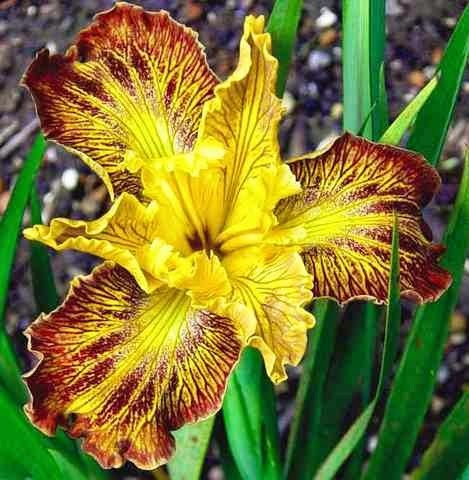 After a false start (growing an iris as ‘Renown’ that was incorrect) I finally got the real ‘Renown’ the summer after I moved to Allen County in 2003. The first bloom was ugly and I questioned the authenticity. In 2005 I grew ‘Renown’ it an upper bed and it blossomed very well! I’ve used tons of pollen from this bed, since my final success. ‘Renown’ reblooms in garden zones north of mine, yet only one stalk has developed here in the off season. I decided to do some serious breeding with ‘Renown.’ It was a bit of a research project for me and there are several seedlings that I like. 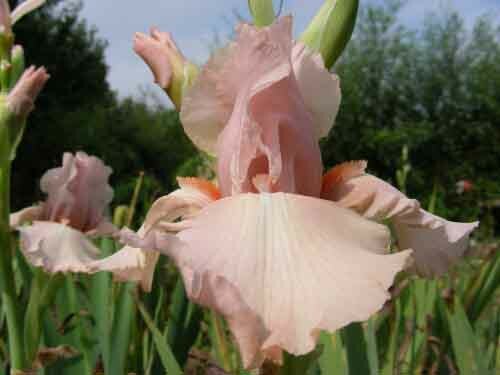 At this point, my favorite ‘Renown’ seedling, 2155-01, is from (Treasured x Renown.) This seedling was a sole survivor from about 50 seed. It has given some lovely seedlings. I was going to name it ‘Wormhole,’ but I was told the name would offend Dr. Zurbrigg! Hope springs eternal in my reblooming heart, so it’s been introduced this year as ‘About Tomorrow.’ It’s my belief this is a very good iris. It’s not missed a spring since maiden bloom, it has always given a good stalk to fan ration, and it’s very pretty, for a white! One day I had a couple of blooms in my hand and didn’t know what to do with them, so, now, I have seed waiting from ‘About Tomorrow’ X ‘Star Gate.’ Although 'About Tomorrow' is white, I expect this cross will breed to the blue/purple side since the two share ‘Violet Miracle’ genes. At the end of August, I’m enjoying bloom on 1907-10Re. 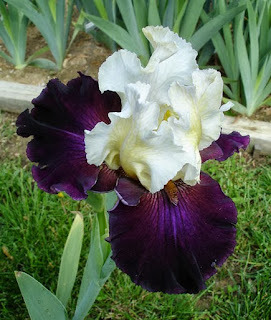 It is a sibling of ‘Cool Character.’ 1907-10Re bloomed all summer in 2011 without missing a day. It looks like I need to line this one out and consider introducing it. It's still purple but it has many good qualities. Maybe the next generation will have other colors! There are more seeds resting in the envelope rack. They will all be planted in pots this fall. Once again, I’ve enjoyed sharing the workings of my mind and the reasoning that went into making the latest crosses. Will any of them produce good rebloomers of introduction quality? I really think the potential is here. 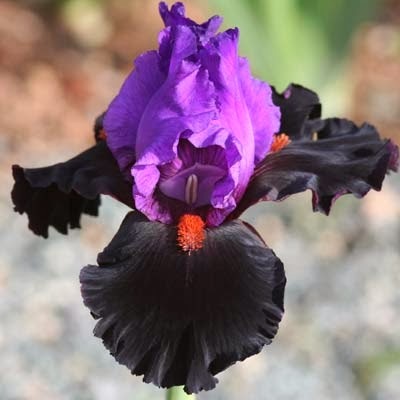 The Fred and Barbara Walther Cup is awarded annually by The American Iris Society to the originator of the iris variety that received the greatest number of votes in the Honorable Mention (HM) award balloting, regardless of classification. All classifications of irises are eligible. Only AIS registered judges may vote. The winner this year is a stunning plicata Siberian iris hybridized by World of Irises blog contributor and iris hybridizer Bob Hollingworth. "Judy, Judy, Judy" is named after his wife, who is a masterful garden designer and who uses Siberian irises to exquisite effect in their home garden. 'Judy, Judy, Judy' (Robert Hollingworth, R. 2004) Sdlg. 02B2B8. SIB (tet. ), 35" (89 cm), Early midseason bloom. Standards medium red-violet; style arms light blue; Falls white, with medium red-violet dots merging into outer plicata band. 97B1A2, sib to 'Currier' X 'Somebody Loves Me'. Ensata 2010. HM 2013; Walther Cup 2013. 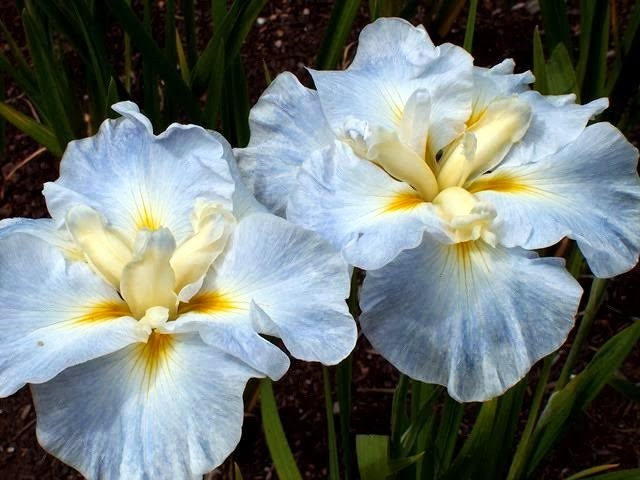 For more information on how to grow Siberian irises, please visit the Society for Siberian Irises. 2013 Hans and Jacob Sass Medal Winner "Rimaround"
'Rimaround' hybridized by Terry Aitken of Washington! 'Rimaround' (J. Terry Aitken, R. 2007) Sdlg. 00M20D. IB, 22" (56 cm), ML. S. white, heavy purple plicata stitching; style arms purple; F. white, very round, 3/16" purple plicata band; beards white tipped purple. 'Art Deco' X 'Fairy Ring'. Aitken 2007. Honorable Mention 2009; Award of Merit 2011. 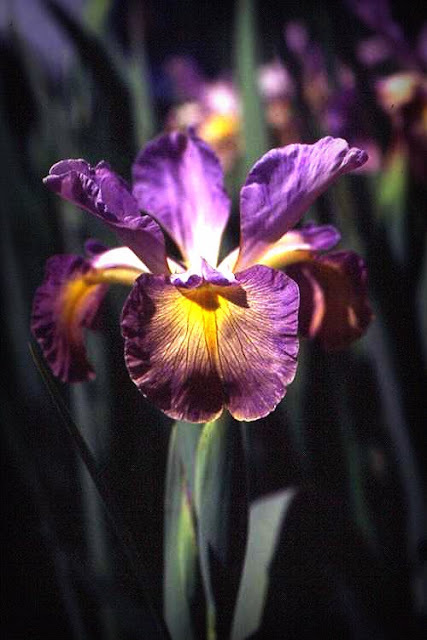 In 1966 The American Iris Society awarded the first Hans and Jacob Sass Medal. This medal is restricted to intermediate bearded (IB) irises. The IBs are 16-27” tall with flowers that are 3½"-5" wide. The IBs fit both in size and bloom time between the SDBs and the TBs. 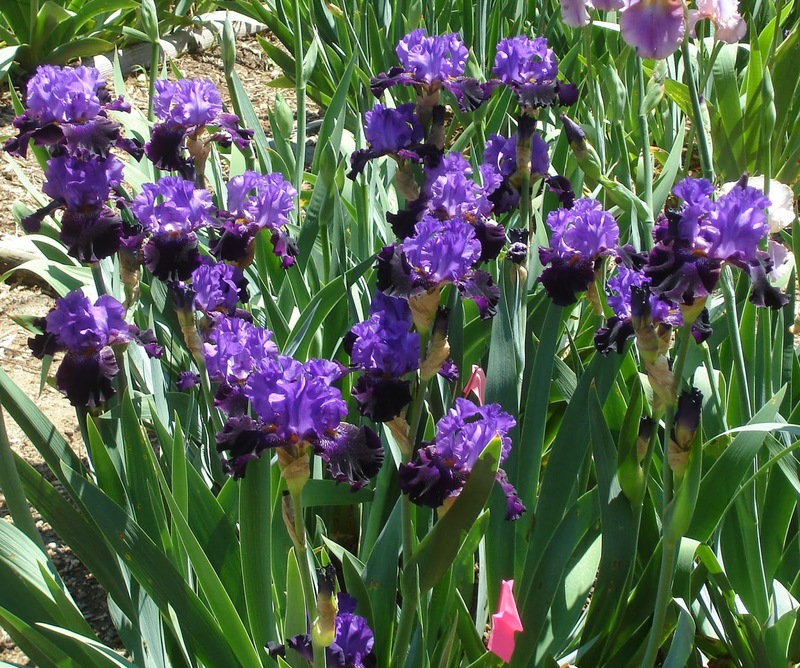 The Hans and Jacob Sass Medals are provided by the Median Iris Society and named in honor of Hans Sass (1868-1949) and Jacob Sass (1872-1945). For more information about median irises in general and Intermediate Bearded Irises in particular, visit the Median Iris Society Website. 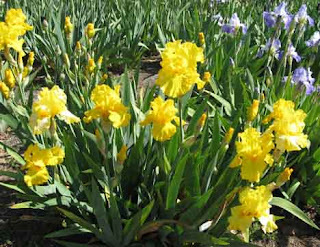 Yet another issue of IRISES, the Bulletin of the American Iris Society, has been completed, and will be arriving at your doorsteps soon. If you are like me, you will probably read this issue cover to cover within twenty four hours. One of my favorite irises (even though they don't grow very well in my area) Siberians, are featured in this issue, on the cover and in a few articles, one of which is about the Siberian Iris Convention held earlier in the year. 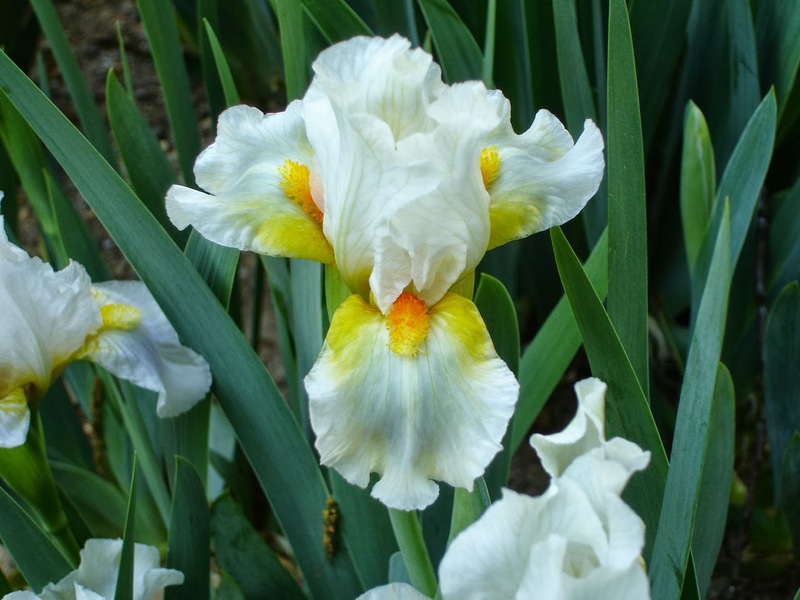 The article by our own blogger, Mike Unser, writing on Jim Gilbson's plicatas for the featured article "My Favorite Irises." Another favorite article this time is about the "Reverchon Park and The Iris Bowl" in Dallas, TX, a park once referred to as the "Central Park" of the Texas park system. Steve Houser wrote a fascinating article that follows into the same lines of a digital program many of us enjoyed during the Opening Banquet of The American Iris Society Convention held earlier in Dallas, TX this year. An in-depth article about the use of herbicides sounds very interesting, and I will need to go back to it to read all the facts and interesting findings. 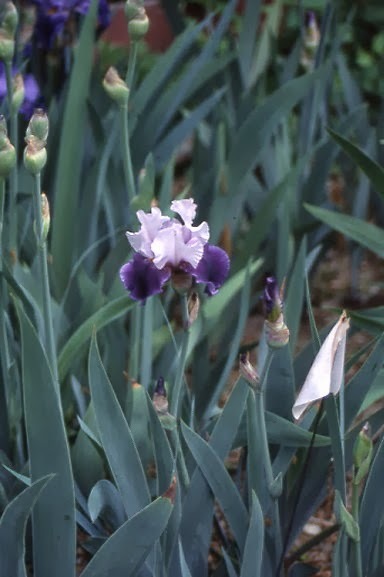 It's called, "Herbicide Studies for Weed Control in Irises," by John Kaufman. The just-announced 2016 Annual Convention to be held in Newark, NJ. 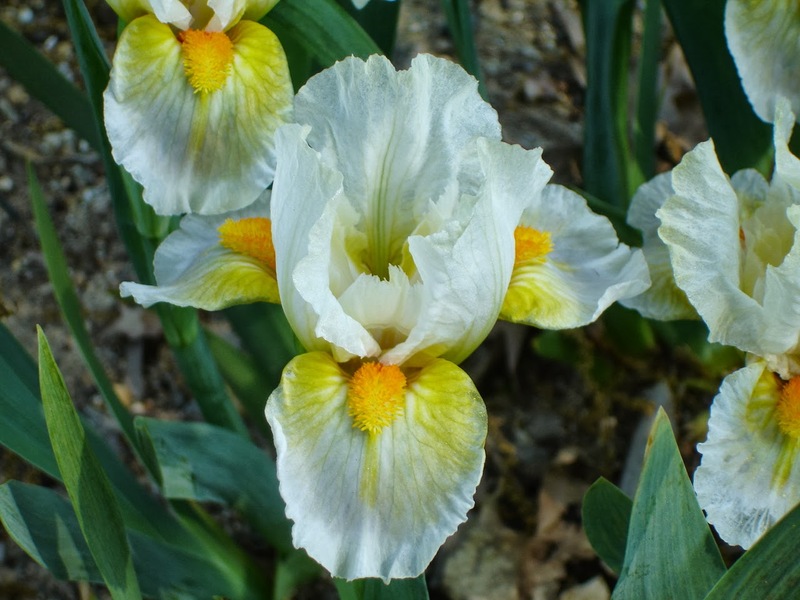 For those new to The American Iris Society, as a member you receive the printed edition of IRISES, or if you are an e-member, then you will be able to read the entire publication online. The latter is a very convenient option for overseas iris enthusiasts. For more information, please go to our website's membership information section. Printed editions are in the hands of the Post Office, the e-version is ready for view at its normal location online. It's a bit embarrassing to write in praise of your own iris, but I do know more about it than anyone else, and "Swans In Flight" is living testimony to the benefits of inefficiency. Around 1998, when it was a seedling, I tried to throw it away. I wasn't at that time looking for a white Siberian so there seemed no reason to save it. We were moving seedlings to a new garden and I was interested in saving the sister seedling next to it, a very tall blue. In moving that, we inadvertently also dug and included a bit of "Swans In Flight". 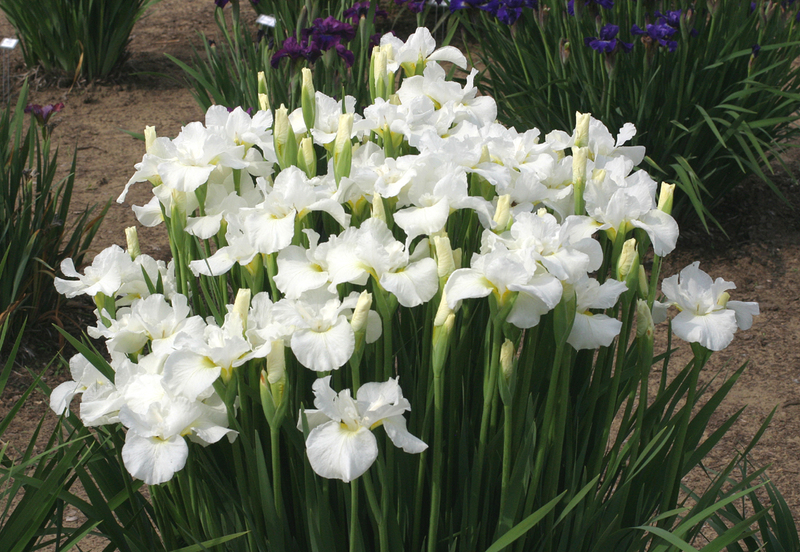 Over time the blue sister turned out to be too tall and the stems often fell over, but mixed in with it was this very large-flowered pure white iris that thrived mightily, grew a bit shorter, and didn't fall over. So blue went onto the compost heap and white was moved along further to possible introduction. "Swans In Flight" proved to be a great grower everywhere with a multitude of flowers that were five inches or more across so that it visually dominated any part of the garden where it grew. It does take some special qualities for a white iris to win a top award, and the vigor and presence of Swans seems to have done it. It's sobering to realize that a few inches to the left with that first spade and it would never have been seen again. For more information about Siberian Irises, please see the website of the Society for Siberian Irises. 2013 Mary Swords Debaillon Medal Winner "James Faith"
The 2013 winner of the award for best Louisiana Iris is "James Faith." This medal is restricted to Louisiana (LA) irises. It is named in honor of Mary Swords DeBaillon (1888-1940). 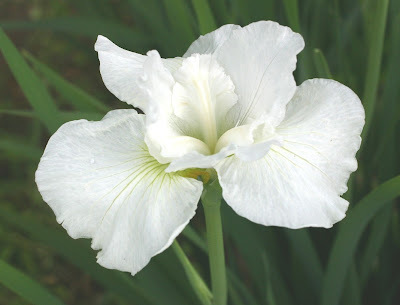 Clarence Mahan writes that "Mary DeBaillon amassed the largest collection of Louisiana irises in the world. She was tireless in promoting these irises as good garden plants and in encouraging any who would listen to grow them. She gained considerable fame as a naturalist and native plant collector. She encouraged collection of the indigenous iris species to save them as civilization encroached on the swamps and bayous. 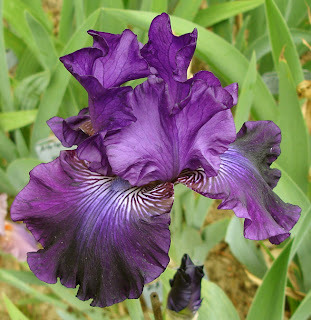 A year after her death the iris enthusiasts in Lafayette organized an iris society and named it the Mary Swords DeBaillon Iris Society. 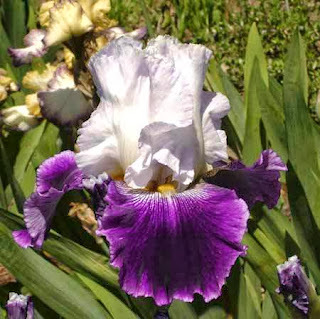 This society became the Louisiana Iris Society in 1948." The highest award an LA could receive from 1948 until 1985 was the Mary Swords DeBaillon Award. 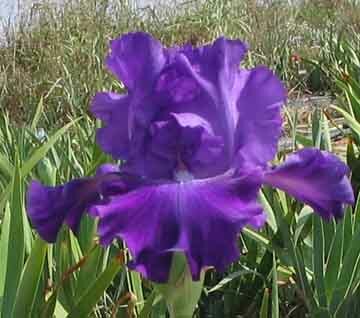 During that period, SLI was an independent unit with no affiliation whatsoever with the American Iris Society (AIS). SLI became a Cooperating Organization of AIS in 1986. After that date the AWARD was discontinued and replaced with the Mary Swords DeBallion MEDAL, the highest award exclusively for Louisiana Iris. The MEDAL is a part of the AIS award system. All AIS medalists, including the the Debaillon medalist, are eligible for the Dykes Medal, the highest award presented by AIS. Here is the description from the AIS wiki: 'James Faith' (M.D.Faith, R. 2000). Sdlg. S54A. 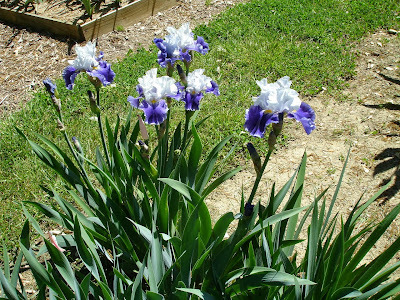 LA, 42" (107 cm), M. S. blue purple, lightly ruffled; style arms blue, reddish cast; F. darker blue purple, large golden yellow signal edged creamy white. 'Bayou Dawn' X unknown. Faith 2002.Debaillon Medal 2013. M.D. Faith says that "this iris is vigorous in growth and very rewarding in the garden." 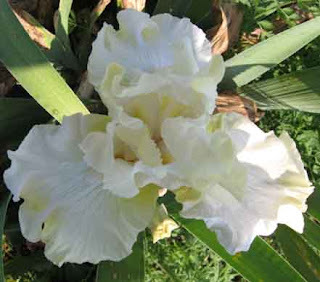 To learn more about Louisiana Irises, please visit the Society for Louisiana Irises website. 2013 Winner of the Payne Medal: "Bewitching Twilight"
Our congratulations to Chad Harris, hybridizer of the award-winning Japanese iris "Bewitching Twilight," this year's winner of the Payne Medal. This medal is restricted to Japanese irises (JI). It is named in honor of W. Arlie Payne (1881-1971). 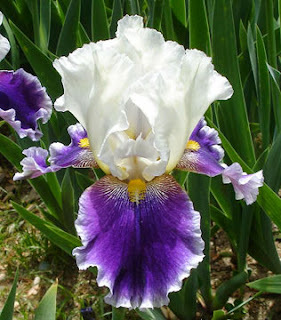 The Payne Medal (named for W. Arlie Payne) is the highest award given by the American Iris Society that a Japanese iris can receive in its class. 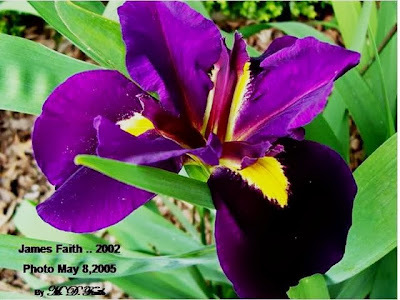 Payne Medal winners are then eligible to win the Dykes Medal, which is the highest award an iris can receive from The American Iris Society. Prior to 1992 the highest award a Japanese Iris could receive was the Payne Award. 'Bewitching Twilight' (Chad Harris, registered 1999). Seedling 89JE6. JI (6+ F.), height 41" (104 cm), mid season bloom. White ground, heavily brushed light blue (RHS 101C) fading to pastel blue (101D), signal yellow (2B) radiating veins extending halfway length of falls; style arms heavy cream yellow. Knight in Armor X Marx seedling Aitken 2000. Payne Medal 2013. More information about Japanese irises can be found at the web page of the Society for Japanese Irises. 2013 Sydney B. Mitchell Medal Winners "Hidden Asset" and "Lines that Rhyme"
The Pacific Coast Native irises "Hidden Asset" and "Lines that Rhyme" share the honor of being awarded the Sydney B. Mitchell Medal this year. This medal is restricted to Pacific Coast Native (PCN) irises. It is named in honor of Sydney B. Mitchell (1878-1951). "Tom Craig wrote this of him: 'Sydney [Mitchell] looked upon plant breeding as a long term international effort in which individuals from all over the world should co-operate and add generation after generation to a real human achievement. He made me feel a real part of this and more particularly a part of a special work started by William Mohr and carried on by himself. Sydney generously gave flowers and plants of seedling for further encouragement with this work.'" Furthermore, Mahan writes that "Mitchell was also interested in the native irises of the West Coast, and promoted them at every opportunity. He took great pride in the plantings of PCNs in his own garden. He had a large collection of various forms of I . innominata and I. douglasiana." 'Hidden Asset' (Duane Meek, R. 2003) Sdlg. P7. CA, 12" (31 cm), EM S. light mahogany veined darker, rim tan; style arms tan, slight pinkish cast; F. deep red veined darker, rim tan, brushed tan blaze with red veining, light streak from signal to near edge. ('Ohlone' x 'Upper Echelon') X ('Native Warrior' x 'Pacific Moon'). Wildwood Gardens 2003. Honorable Mention 2008; Award of Merit 2010; Mitchell Medal 2013. 'Lines That Rhyme' (Joseph Ghio, R. 2002) Sdlg. CP-110H. CA, 13" (33 cm), ML. S. gold with brown veining; F. gold, brown lines and dots radiating to wide brown rim, signal violet tan. 'Rancho Corralitos' X PB-207L: ('Jacks Are Wild' x ('Charter Member' sib x 'Rainbow Connection')). Bay View 2003. HM 2008, AM 2010; Mitchell Medal 2013. 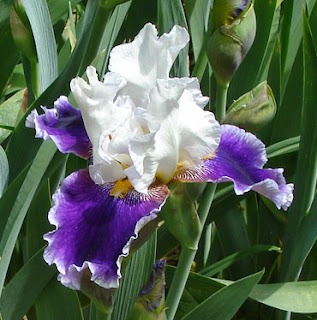 To find out more information on Pacific Coast Native Irises, please visit the Society for Pacific Coast Native Iris website.